Firefox Mobile Beta: native UI at last! The wait is finally over, no need to go through the daily Aurora upgrade process any more; Firefox Mobile 14 beta (available in the Google Play store) is out with all the improvements that were in the Aurora builds. The main differences with the previous (non-Aurora) versions: Firefox on Android doesn’t use XUL (the Mozilla cross platform UI toolkit) any more, but switched to native Android UI elements. This (and other less visible changes) results in faster startup time, lower memory usage and better overall performance. There’s Flash in it as well, but with ‘tap to play’ option so the impact, I’m happy to report, is pretty limited. And the start-page is pretty nifty, with “Top Sites”, “Tabs from last time” and “Tabs on other computers” on one nice screen. I must admit I was slightly worried at first, as I couldn’t get Sync to work at all (“could not connect to server” and similar error messages), but after uninstalling Aurora, Firefox Mobile Beta can sync just fine. 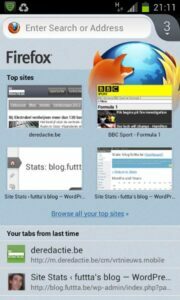 All in all Firefox Mobile is an even greater browser than it was before. This entry was posted in android, browsers, firefox mobile, lang:en, mobile web and tagged android, firefox sync, native ui on 16 May 2012 by frank.